Other: Options gourmet cooking, yoga, singing, paragliding. Sample a slice of authentic French life with a French immersion homestay at Emilie & family in idyllic South-West France, at the foot of the Pyrénées Mountains.Their renovated French farmhouse offers breathtaking views over the countryside, especially stunning at sun down. 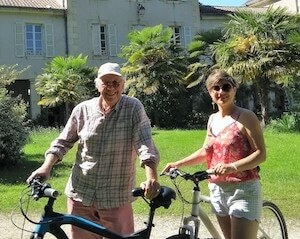 Your graduated & experienced French teacher Emilie, her husband David and children Myrtille (11) & Aristide (17) enjoy cycling, cooking & eating, laughing, music: you will feel welcome by this dynamic family eager to help you practice your French in this scenic off the beaten track region of France. Bonjour! My name is Emilie, welcome to our home. I am a native French woman born of German and Belgian parents. I speak German, English, and Spanish and always dreamt to be an “ambassador”. I am a certified French teacher from l’Alliance Française and I have a DAEFLE degree in teaching French as a Second Language. For the last six years, I have been teaching children and adults of all ages from beginners to advanced level. I also give language lessons to our local refugee group, which has been a rich and rewarding experience. 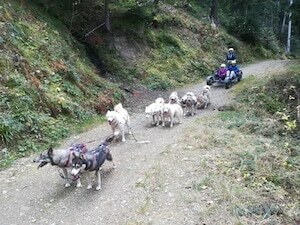 Being very fond of wildlife and open spaces, my husband David and I decided to bring up our two children in the marvelous countryside of the “little Pyrenees” between Toulouse and the Pyrenees mountains. Our two children, Aristide 17 years and Myrtille, 11 years old, both love having foreign guests around. Myrtille is eager to be a “little French teacher”: she is patient and lots of fun to be around and will enjoy playing French board games with you if you are so inclined. Finally, we have a cat called Eustache – a very old-fashioned French name: it’s our little nod to all that is retro! Life here combines calm and quiet with convivial social gatherings. My immersion style is to really include my students in our everyday life, take them to meet our local friends, enjoy with them the local events happening all around us: it’s a real opportunity to see another side of French contemporary life! 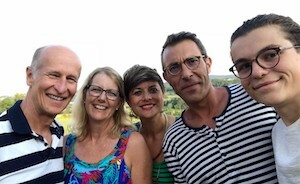 We recently moved to a new house as we wanted the perfect place to welcome students for French immersion homestays, and luckily found the ideal place to do it! Our former farmhouse has just been totally renovated: wood, stone, and metal offer a sleek and simple décor combining modernity and tradition with space. Almost all year round we use the deck as an extended living space for everything from a morning coffee to an alfresco teaching space. It is also the best place to watch wild deer and the really wonderful birds of prey who are regular visitors. There’s a comfortable sofa and a piano in the right corner. On the weekends, Myrtille and Aristide like to cook homemade cakes, crepes, and other goodies! We especially like to gather in the convivial kitchen while cooking and talking about the day. The house is large enough to have both shared and private areas, and I have a dedicated classroom available for teaching. I do like to get out of the classroom; we have plenty of other places to choose from, and the garden can be lovely too. Your private suite is furnished with one double bed and two side tables, a desk, and a chair, and has an adjacent dressing room. Your modern private bathroom has a shower and double-sink, and there is a separate toilet just next door. The suite accommodates either a single person or a couple. It can be adapted to welcome a family with one child – we’d then bring in an extra bed. The house was built to achieve maximum light in the day throughout the living areas, and of course the deck. Bedrooms are dedicated to rest and are more intimate with smaller windows: a private, cozy and relaxing atmosphere. In reality, we are only 8km from the nearest village, called Aurignac (o-ri-niac). It’s a pretty and vibrant medieval village, with lots of history, local shops, two restaurants, a great bookshop/cultural space, a museum, as well as a cinema, open-air pool in the summer and tennis courts. Further afield we can also visit Toulouse “the rose city”, the regional capital of Occitanie, with its charming city center of rose pink brick buildings, museums and café life, great for shopping and all things cultural. In winter, skiing is also an option with several choices of resort, including Superbagnères and Peyragudes, and for the very daring among you there are paragliding and via ferrata opportunities. Walking, hiking, cycling etc… are readily available around hour house. We can hop over the border into Spain for tapas in the typical Spanish mountain village of Bossost! Our nearest international airport is Toulouse. Trains from Toulouse arrive in nearby Boussens, from where we can easily pick you up. Other regional airports are smaller but worth looking at, such as Lourdes and Carcassonne. To really make the most of your stay I recommend that you rent a car, but it’s absolutely no problem if you would prefer to be picked up at the train station, not bother with a car, and take things at a slower pace. Wi-Fi is available throughout the house (although a bit slow) and inside the house is non-smoking. You may smoke in the garden if you wish. There is central air throughout the house. As we have a shy cat, I’m sorry but we cannot welcome your pet. 15 hours tuition – usually 3 hours in the morning over 5 days. Comfortable suite with private bathroom. 3 meals a day: breakfast with myself and my daughter Myrtille, a lunch with myself or a prepared picnic lunch for days when you prefer to go out sightseeing and a family dinner with Myrtille, David and me: Aristide will join us over most weekends. 2 accompanied excursions or cultural activities – eg. 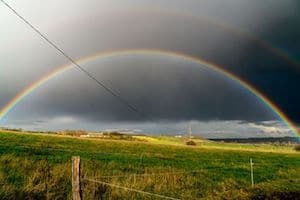 a visit to Aurignac, Saint-Bertrand de Comminges, Toulouse, a walk through fields and woods or in the mountains, a visit to a local château or special garden, a local festival, preparing a French specialty dish together – according to your interests. For this program, the fee for one person is 1400 Euros per week. Euros 805 in full board with shared lessons and excursions. There are other options for more tuition or excursions further afield… I am flexible, and will happily adapt to special requests. There are so many things to do around here, and so many interesting French people to meet. I personally contacted these reliable professionals who are eager to meet French immersion students, and help them practice their French. Should you have other interests, please let me know: I can probably arrange something for you! Gourmet cooking class, gathering and using wild plants, with Anna Lisa or Vanda. 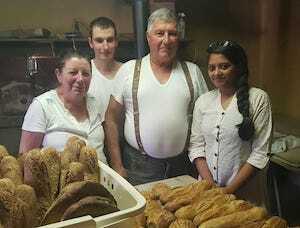 Baking bread with a family of French farmers. Kundalini Yoga focusing on breathing with Laurence. 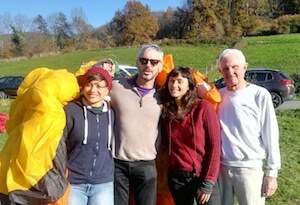 Paragliding with Philippe who is a certified paraglider. 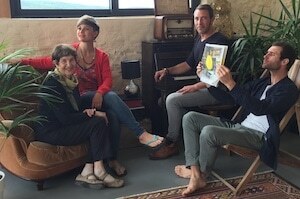 Whether it is for an intensive brush up of your French, a chance to sample authentic family French life and converse, or the possibility to overcome those fears that have been holding you back, I’m here to help. My teaching approach is to first make you feel comfortable and create a relaxed atmosphere for you to learn with confidence. 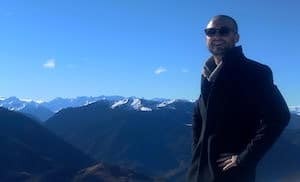 As an experienced and graduate French teacher, I use a lot of different tools to teach, and together, we’ll design a tailored program to best fit your needs, learning style and interests. Learning French in immersion is a fantastic way to put theory into practice: studying with me will be a great confidence booster, and I’ll do my very best to make sure you also have fun along the way! 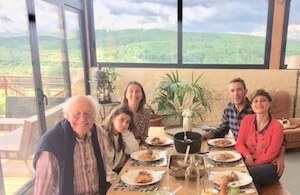 My family & I really look forward to helping you progress in French and have a truly unique stay in this stunning part of France. 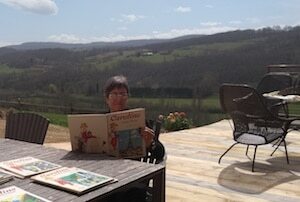 Follow Emilie’s Bilingual Articles On French Today, Where She Talks About Her Beautiful Region. 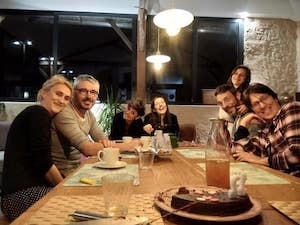 My experience learning French with Emilie and the homestay with her interesting, talented and warm family will forever be a lasting memory and one from which I can draw on in many ways. From the moment I arrived at the train station in Boussens I felt welcomed and accepted as part of the family and their circle of unique friends. The picture-postcard setting of the country house with its luminous spaces, the small idyllic farms and old stone buildings of the surrounding area and especially the many and varied daily experiences and actvities with others created for me the perfect balance in which to deepen my understanding of the French language and culture. 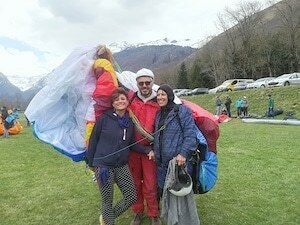 Some of the highlights I was privileged to enjoy included spending time at L’Abris, a migrant welcoming center in Aurignac and getting to know a young lady from Azerbaïdjan who was temporarily lodging at David and Emilie’s house ; going paragliding with the experienced, funny and generous Philippe and celebrating ( 2 times ! )Myrtille’s 12th birthday with great cakes baked by Aristide. I can’t say enough about how wonderful my stay was with Emilie and her lovely family (husband David and daughter Myrtille)! 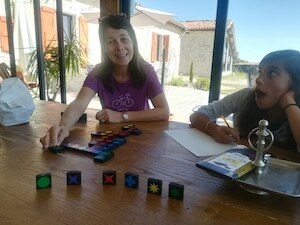 My French was very beginner level upon arrival, but Emilie had no issues adapting the lessons to accommodate my needs. 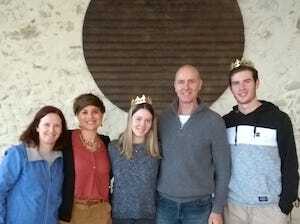 I was very nervous about doing an immersion stay, but Emilie and her family immediately put me at ease and gave me plenty of support during all the outings. I feel my French improved greatly and I have a good plan to continue studying! During my week, Emilie took me on many interesting outings as well! We attended an amazing chanting yoga class and also a local folk music concert which was just incredible! We took a lovely walk to buy bread in a nearby castle. We also attended a local dance session with friends and neighbors which was great fun! Emilie and David are fantastic chefs as well! All the food and meals I had during my stay were outstanding! They use fresh, organic produce and meats and provide incredible cheese as well! Overall fantastic, transformative experience and hope to return again someday! Emilie is a warm and welcoming hostess. She is an intensive tutor of French who speaks fluent English. She lives in a spacious house in the remote countryside. She was attentive to all of my needs and worked hard to satisfy them. She is an excellent chef, who varied her menus according to my dietary preferences. 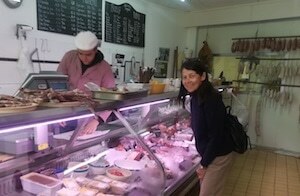 We visited supermarkets and shops, farmers’ markets, and nearby villages. She offered to take me on many other excursions. My French foundation was tenuous when I arrived, so we started with basic principles, such as the pronunciation of the alphabet, the use of numbers, and telling time. In preparation for my meeting with a real estate agent, we worked on common vocabulary for houses. I believe my comprehension of spoken French has improved, and I’m more sensitive to its nuances, although I still have a lot to learn. I’m already planning a return visit. I had the pleasure of staying with Emilie and her family for a week. It was an amazing experience in which I enjoyed so much ! They were welcoming and very friendly and kind people. The lessons were a lot of fun and they went very quick. I have learnt many things for daily life and new and interesting things that I would have never had known. I enjoyed everything here and Emilie is an amazing teacher. I highly recommend her as teacher. I’m very fortunate to have stayed her. Thanks! This is Priyanka Agrawal, an entrepreneur, teacher and I come from the land of rich heritage and culture INDIA. These 11 days were memorable and taught me what a real journey is. It is not a touristic visit of the monuments but also an immersion into the entirely new place. 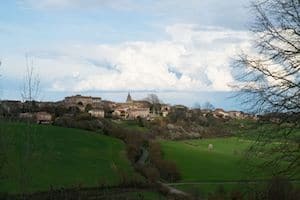 From the time I reached Benques the pretty village which is 1 hour from Toulouse, I loved it. I was well received by the family and everything was well planned. The room was perfect and grand. Emilie gave me just that I had longed for. I did many interesting visits and practised my French. I practised my French in a practical way more often but which is what is really needed in my day to day life. I got a lot of study matter and online books to study for the exams that I am to give in India which was one of the sole reasons for my visit too. 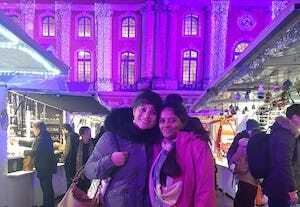 The entire journey was enriching filled with learning the real French culture like attending a musical event, visiting touristic cities like Toulouse and Carcassone, shopping, trying the local cuisine and seeing the real art of french baguette making. We use to walk on the streets and greet people and make conversations. This was only possible because of the great relations Emilie had with the people. Emilie and her family is very kind and is always positive about everything you ask for. I had real wine tasting lessons with Emilie’s husband who was a wine expert. Emilie has a daughter who has a bright future and is very intelligent. She is very warm, matured and a wonderful person. It was a pleasure to know her. 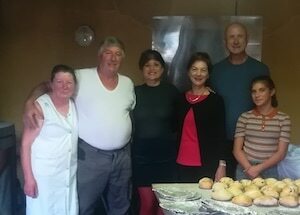 It was great to cook with the family a real Indian meal with the real Indian spices and local food available. I am sure to revisit her as there is still a lot to experience there. If anyone is really looking for a real and wholesome experience then visit Emilie definitely once. It will be THE EXPERIENCE of your life! Emilie is a strong character, clearly an experienced French teacher with great patience. My needs and standards were assessed rapidly: the course needed was provided with skill and fun, for 3 weeks and suited and helped me exactly. Emilie is very organised; great delight was taken in providing super meals and introducing me to of the village becoming part of the life. The course is an Immersion. 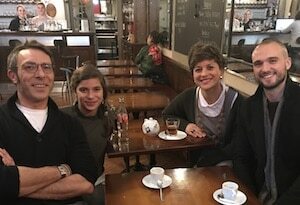 Emilie saw that I was part of her charming family., who had repeated conversations with me (in French of course!). Benque appears isolated but is reached by train from Toulouse to Boussens, or car if you wish to rent. The social side was fantastic; paragliding, dog sledding, pool swimming, yoga, theatre, cinema, hat fashion parade, refugee meeting and a day visit to Toulouse to see the exhibition of theatrical machines including the Minotaur. The lessons were each morning, but really continued all day. My room was a luxurious bedsitter. This was a wonderful Immersion. 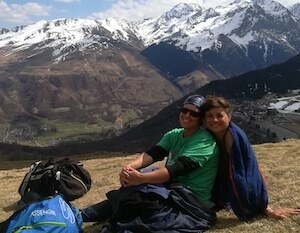 We had a once-in-a-lifetime experience with Emily and her family in the Petites Pyrenees. From the moment we arrived – and really even before – Emilie and her family were warm and welcoming. 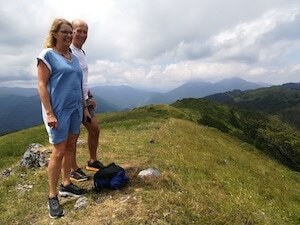 Throughout our two-week stay, we enjoyed very comfortable lodging and three delicious meals a day. A special thank-you to David, Emily’s husband, who after work each day helped prepare wonderful regionally inspired dinners! 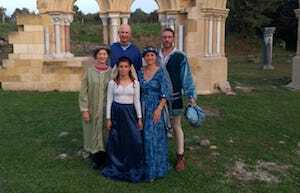 In addition to our French studies, we had a full schedule of local activities where we met Emilie’s friends and neighbors, including a day of artisanal bread baking, a costumed dinner dance at a medieval chateau, and a traditional French birthday party. 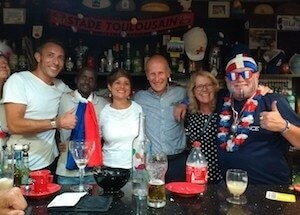 Our experience here will leave us with many wonderful memories and a better understanding of French culture. I knew it would be a great week the moment we drove up and saw the family outside waving to us as we drove up the hill to their home. 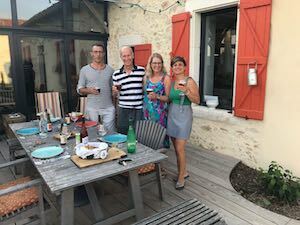 I jumped right into the French language by attending a « guinguette » that afternoon at a lovely home of the host family’s friends. 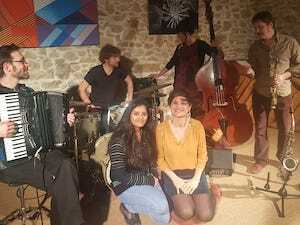 There was music, dancing, French conversation and delicious food and wine shared by everyone. 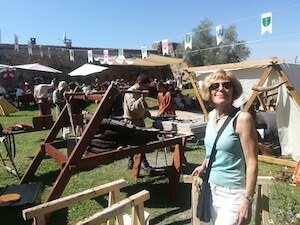 All week long Emilie was willing to share local cultural events of which there were many to chose from. 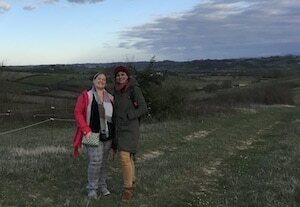 We went to a yoga class together, walked along the countryside to a former château to buy freshly baked bread, toured local villages and went shopping in local stores. Emilie’s family is very involved in their community, so we were frequently greeted everywhere by neighbors and friends. Being able to connect with locals while traveling really makes a world of diffference! But of course I really came for the lessons and they were certainly rated at 10 ! This was not my first time taking an immersion course, so I knew what to expect, but Emilie went beyond my expectations because she had taken lots of time to tailor the lessons specifically to my needs. The questionnaire she has prepared for her students is really a fantastic idea and allows her to customize the lessons in advance. We worked on my weak areas, with some grammar and pronunciation as we went along. Some morning we watched short videos tailored to my needs that were very helpful, interesting and made the time fly by. Emilie takes terrific notes on your studies each day allowing you to focus on what is really important. I ended the week with a wonderful summary that is very practical and will contribute significantly to my conversational skills in the future. verb conjugations. What a great way to end the week! C’était top ! Thank you Emilie for your dedication and the hospitality shown by your family. It is an experience that will forever remain with me and I left many fond memories. 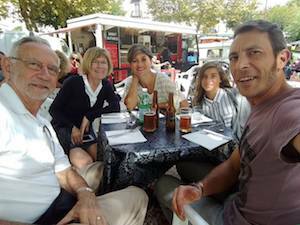 My husband and I spent one week in September with Emilie and her family. I studied French. My husband relaxed. Together we thoroughly enjoyed the warm welcome, the beautiful house and surroundings, and the opportunity to share French life in a way not possible when foreigners like us travel on our own. Emilie is a great teacher of French language and culture. She shares her knowledge in a way that keeps the lessons from being pedantic or dull. She works with the level you’re at, correcting errors as they happen and explaining what is “au courant.” And she takes you into her life so that the French you are hearing is real, not theoretical. She also figures out what kinds of things you are interested in and finds ways to include them in the schedule. 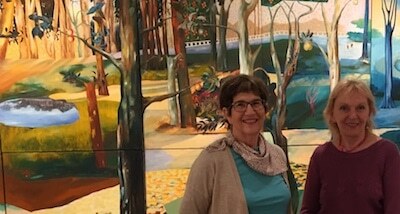 For us, for example, having learned about my past work in ceramics, Emilie arranged for visits to a wonderful ceramic artist and a private museum that focuses on traditional faience tiles and pottery along with modern artists’ work. The people we met in those activities were a wonderful treat of their own. 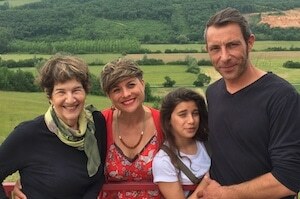 While improving my French was the primary goal of our visit, my husband and I found the time with Emilie and her family to be satisfying on a deeper level. We loved hanging out with David while he cooked and after dinner under the stars. We loved getting to know Myrtille and being an audience for her developing gymnastic practice. Her physical flexibility and her sense of humor are fantastic! We enjoyed our limited time with Aristide, who was off at school during the week. He showed a fine sense of design and presentation in serving up the tarte tatin that (ok, I admit it) I made. And of course we had a great time being with and observing Emilie as she went about her daily activities, shopping, helping asylum seekers, and giving bisous to virtually everyone we met. It is clear that Emilie loves everyone, and they love her back. 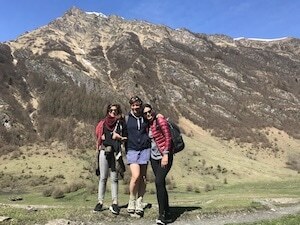 If you are looking to learn or improve your French but also to have a very special and wonderful experience, we highly recommend doing an immersion program with Emilie. I’m Maria, I’m 15 and I have stayed with Emilie and her family for 2 weeks. I have really enjoyed my time here, getting to be a part of their family, meeting their friends, and going on trips together. They made me feel welcome and comfortable from the start, and they have truly built my confidence when it comes to speaking French. 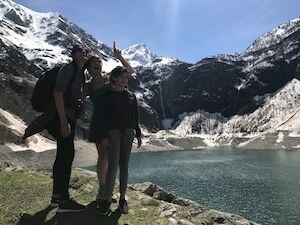 We have been hiking in the mountains, canoeing down a river, and they even convinced me to take part in a show as a dancer along with Emilie and her daughter. I have learnt so much more casual and useful vocabulary for everyday scenarios from being here and being a part of their daily live that I would never have learnt in a classroom. Mon séjour d’immersion chez toi en famille était un vrai cadeau pour moi. 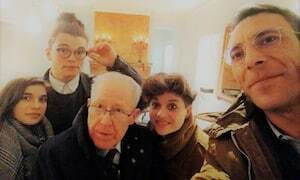 Un grand merci et beaucoup de bises à toi, à Myrtille, à David pour votre accueil si chaleureux, votre générosité, votre gentillesse, votre aide linguistique, pour tout ce que vous avez partagé avec moi : des amis courageux et créatifs, les repas délicieux, la Lune, le Soleil, la Nature, la Chaleur, l’Histoire et la vie quotidienne des Petites Pyrénées. 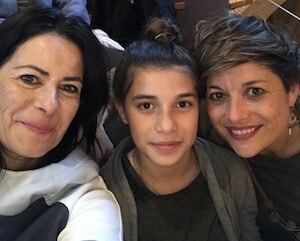 A tous les trois, je vous remercie de tout mon cœur. Our stay with Emilie has been truly memorable. From the moment my husband David and I arrived she made us feel so welcome and comfortable and her enthusiasm for everything and everyone is contagious! Over the past week we have experienced many wonderful occasions ranging from a magnificent balade in the Pyrenees followed by a refreshing swim in the clear waters of the river, a fun-filled evening with the locals watching France play in the World Cup football, a visit to a Boulanger in a chateau, an evening performance by a group of travelling actors and a delightful barbecue with friends on the magnificent terrace. 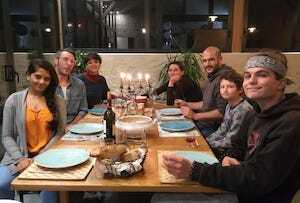 We have also been so fortunate that Emilie’s husband Davide has been on “vacances “ and he has prepared for us many absolutely delicious meals. 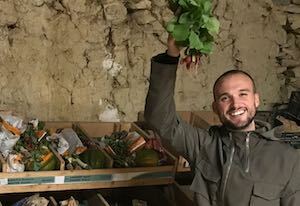 Davide and Emilie cook with the freshest local produce and create amazing and healthy meals with ease. Every meal has been an absolute delight and nothing has been too much trouble. Emilie worked tirelessly over the week to make sure we experienced many different and interesting things and managed to juggle teaching at two levels with absolute ease and patience. We have loved our stay and would recommend it highly and hope one day to be able to return to this wonderful part of the world. 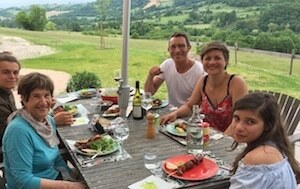 What an incredible week I just spent with Emilie and her family in their restored farmhouse at the foot of the Pyrénées. The week began with a wonderful welcome from the family and friends and the opportunity to speak French with many interesting people. As a teacher, Emilie recognized exactly what I needed to improve my French and we worked on that during the week. She is an oustanding teacher. And speaking with the charming Myrtille was a delight. 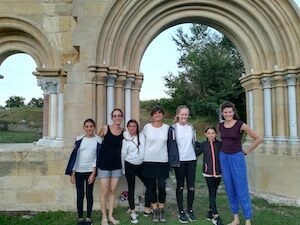 In the beautiful countryside there are also opportunities for cultural outings. 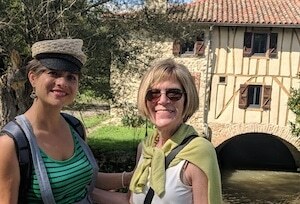 We had a yoga class together, visited a artisans market, a museum called « Musée de la Peinture de Saint-Frajour » met a Yougoslav artist ( more French conversation), a tour of the medieval village of Aurignac and a charming tour in Toulouse. I also had the good fortune to be here during the « Ciné-Sciences » festival to watch documentaries and listen to the directors speak about their film. Emilie is very creative in finding opportunities specific to the needs of her students. This truly was an experience I will always remember as highlight of my life. I can recommend Emilie’s immersion to anyone who would like to learn or improve his or her French, while enjoying an outsanding experience. The immersion was « au-delà de mes attentes » ( beyond my expectations ). Thank you Emilie, David and Myrtille. 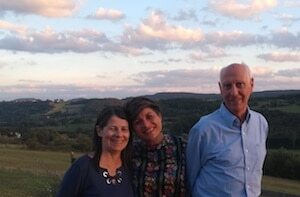 I have just spent a most wonderful week with Emilie and her family (Husband David and children Myrtille and Aristide). From the moment I arrived I was immediately made to feel like a family member and given my own bedroom and bathroom, in the most charming house, situated on a hill with spectacular views over working farms and the snow covered Pyrenees mountains as a backdrop. 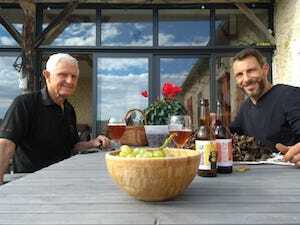 The meals made by Emilie and David were healthy and delicious and in the evenings they often invited friends to join us which added both interest and conversation. 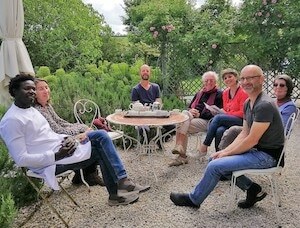 We made visits to the local ancient town of Aurignac a few kilometres away to a magnificent Chateau housing a spectacular collection of 16th and 17th century ceramic tiles and to the beautiful home and studio of local sculptor Guy Reid. I brought my bike with me and this made it possible for me to explore the local lanes and villages in the time away from the classroom. Emilie is a very good teacher. She has a profound knowledge of French and she speaks very good English. I needed a foundation in French language and she has given this to me slowly and very patiently. The week here has been enormously beneficial for me language wise but it has also been a great pleasure and a privilege to be with this family in their home. 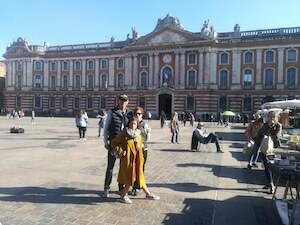 I was given a last minute opportunity to travel to France with my husband whilst he was doing business in Europe. One of my life goals is to learn to speak French. I wasn’t keen on attending a language school and during my search for something different, came across the French today website . 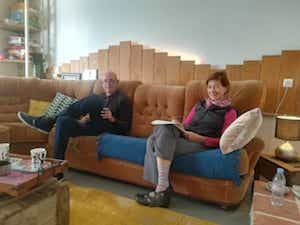 An immersion stay sounded fabulous and I booked with Emilie. Emilie fetched me from Boussens train station and immediately made me feel welcome and at ease. 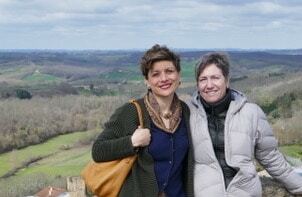 We arrived at their restored farmhouse with amazing views over the countryside. I met David and the adorable Myrtille who were as friendly and welcoming. Emilie is an excellent teacher, very flexible, well organised and was very patient with me . Myrtille is a great little teacher too and helped me with my numbers. I feel that I have better attuned my ear to the language and feel more confident when trying to converse in French. 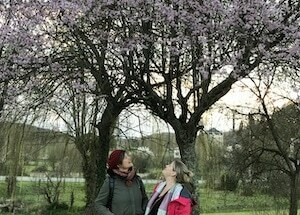 I had lots of fun and enjoyed walks to Aurignac, around the area and to Lac DôO. We cycled, picnicked, went to Toulouse to see a Baroque concert, enjoyed lunch at the Aurignac market and met some of Emilie’s friends. The week just flew by and thoroughly enjoyed being part of Emilie’s family. 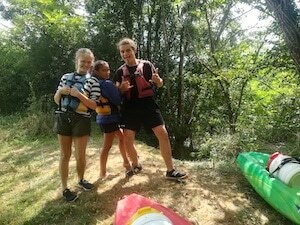 An immersion stay is a wonderful way to experience a bit of French culture and life whilst learning French. I would highly recommend a stay with this lovely family. It was with no small degree of apprehension that I signed up for a week of immersion with Emilie and her family. 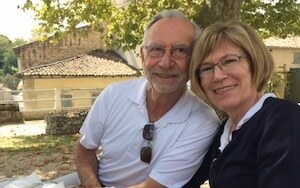 My wife and I were immediately placed at ease as we met our temporary French family in their country home overlooking the areas of lush green farmland with the spectacular Pyrenees mountains as a backdrop. Emilie and I made a plan for the week and happily we accomplished all of our listed objectives. She remained patient and empathetic to the mental work required to learn a new language. Additionally, my wife, who accompanied me was included and made to feel welcome, even as a non-student. Family mealtimes were a treats well beyond expectations. I am ever so thankful for this experience and recommend Emilie to others without reservation. 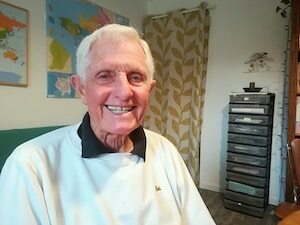 I chose an immersion experience because living in New Zealand & Australia affords virtually no exposure to the french language, and many courses over the decades had not improved my ability to speak french with confidence, even though my enthusiasm for becoming fluent in french remains a lifetime goal. 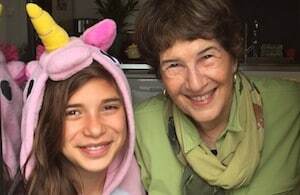 Emilie & David were hosting a birthday party for their 11 year old daughter Myrtille when I arrived & although they were busy, made me feel very welcome & part of the family absolutely immediately. Emilie and her family are warm, caring, friendly and clearly enjoy sharing their spacious, comfortable, quiet home. The setting is idyllic, being rural with a fabulous view of the Pyrénées on a clear day, but only a few kms from the charming village of Aurignac. Emilie was super organised for my visit with teaching materials and options for activities well prepared. At the same time one of her greatest strengths proved to be her flexibility, so that she could change plans at a moments notice and still distinguish relevant teaching points. In fact, no opportunity was lost to teach either language or culture. It was great to learn colloquial phrases and be able to hear them and practise them at the dinner table and other everyday situations. I found Emilie to be an experienced and enthusiastic teacher. With a kind, fun loving nature and good sense of humour, Emilie was also patient and understanding of my needs. One week is a very short time to attune one’s ear to a new language, assimilate grammar and vocabulary and converse with french speakers. However I’m pleased to say, that thanks to Emilie, I am now more confident to try conversing in french whilst travelling around France. I can’t wait until I can come back again, and enjoy the pleasure of Emilie helping me achieve a higher level. I stayed with Emilie and her family for 2 weeks full immersion. I cannot speak highly enough about the experience, Emilie and her family were just fantastic! They welcomed me into their home and lives from the very start. Their family home is a beautiful converted farm house with awesome views over the nearby countryside and the distant Pyrenees mountains. 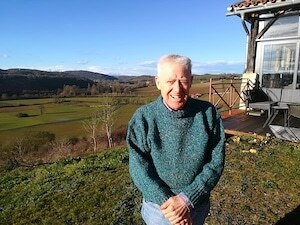 Every day we ate delicious meals prepared using fresh and organic food, and we drank a glass or two of great red wine. Emilie is an excellent teacher; she prepared structured and tailored lessons in a fun and informal environment but was also very flexible to my changing levels in motivation! My French has improved drastically, thanks to Emilie. Emilie introduced me to many of her friends living in the area, who were all very interesting and creative people and lots of fun. 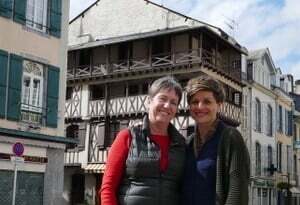 Emilie arranged a number of great activities during my stay, from a day hiking in the Pyrenees, selecting and delivering farm grown organic vegetables to her friends and neighbours, long walks in the local countryside and villages, markets, to even a New Year’s eve party with all their friends! 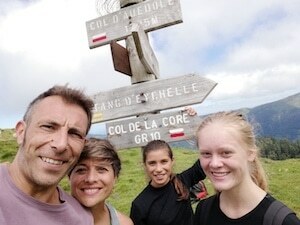 Having said that, Emilie and family also made sure I had plenty of time for myself to enjoy the area, exercise and just relax – which this immersion is great for. I returned to the UK feeling relaxed, revitalised and determined to come-back! I highly recommend an immersion stay with Emilie and family!